Three weeks later the world was advised of the coming of a new breakfast food, heralded under the resounding name of Filboid StudgeH.H. Munro, better known by his pen name, Saki, wrote wickedly comic satires of upper-class Edwardian life. 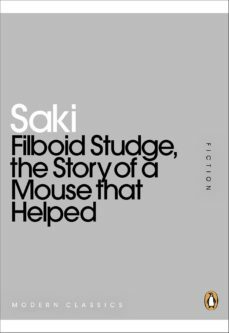 These seven short stories are macabre and extremely funny: they include a cat that is regrettably taught to speak, a vicious pet ferret worshipped as a god, a businessman triumphantly selling an unpalatable breakfast mush, and many dark twists and barbs.This book includes Filboid Studge, a Story of a Mouse That Helped, Todermory, Mrs. Packletides Tiger, Sredni Vashtar, The Music on the Hill, The Recessional and The Cobweb.